HOD: Prof. (Dr.) Anilbaran Singhamahapatra,MBBS, MD. E mail I.D : anilbaran@gmail.com. All new entrants to this college are to learn physiology to start with. Physiology department is entrusted with this job. It is thus responsible for teaching physiology to the postgraduate and undergraduate students of various disciplines. It conducts various academic programs in a suitable manner to introduce the students to medical profession. Effect of Zn supplementation in Diabetic Neuropathy. Knowledge Regarding Diabetes among Women Residing In Kolkata, West Bengal, India. Essential of Medical Practical Physiology. Clinico-haematological profile of sickle cell disease in Chattisgarh, Central India. Cast distribution and comparative clinical picture of sickle cell cell disease, prevalent in Chattisgarh, Central India. Epidemiological profile of sickle cell cell disease, prevalent in Chattisgarh, Central India. Hospital based study on pulmonary function tests and exercise tolerance in patients of chronic obstructive pulmonary disease and other disease. Sonali Majumdar, Sangita Sen, Salil Kumar Mondal. Comparative study to assess whether high sensitive C - reactive protein and carotid intima thickness improve the predictive accuracy of exercise stress testing for coronary artery disease in perimenopausal women with typical angina. Sonali Majumdar (Das), Sarmistha Mukherjee, Anil Baran Singhamahapatra, Munna Das, Saibendu Kumar Lahiri. Sonali Majumdar, S Sen, Salil Kumar Mondal. Jayanta bhattacharya, Manika sadhu, Salil Kumar Mondal, Trisit Roy. Analysis and evaluation of different causes of epilepsy in West Bengal. Jayanta bhattacharya, Manika sadhu, Salil Kumar Mondal, Trisit Roy. Jharna Mukherjee Bulbul Mukhopadhyay, Indranil bose. 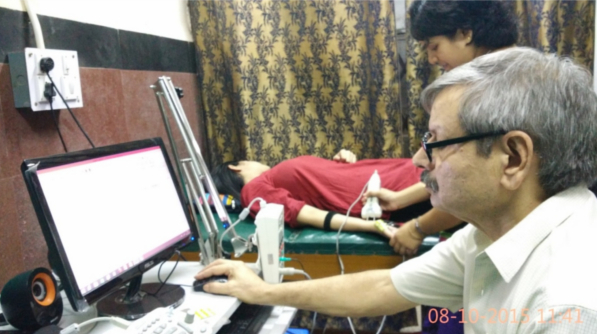 Sonographical Assessment of portal vein diameter in West Bengal, India. Octa Journal of Environmental research. Jayanta Bhattacharya, Aditi Das, Anish Bhowmik. Jayanta Bhattacharya, Anish Bhowmik, Debajyoti Das, Siddartha Das, Subrato Ghosh. Psychological stress : probable aetiological factor of epilepsy. Clinical and Electrophysiological study of peripheral nervous system in jeriatric age group of Eastern part of India. Debajyoti Das, Siddartha Das, Anjali Bagchi, Jayanta Bhattacharya,Sumana Maiti, Sanhita Mukherjee, Subrato Ghosh. Md Mahboob Alam , Sumantra Sarkar, Parasar Ghosh, Biman Ray, Rakesh Mondal. Knowledge and practice regarding pulmonary tuberculosis among private practitioners. Basu M., Sinha D.,Das P., Ray B.,Biswas S., Chattopadhyay S.
Basu M.,Das P., Daqsgupta U.,Ray B.,Das PK., Mandle, M.
Prabir Sinha Roy, Arunima Chaudhuri, Suranjan Banerjee, Debasis Adhya, Sarit Kumar Chaudhuri. Oxidative Stress in Alcoholic and Viral Hepatitis”. Dr. Anindya Roy et al, Published in North American Journal of Medical Sciences.-September-2012-Vol-4(9), Page-412-415. Ganguly A., Roy A., Das A., Banerjee J., Sen S., Adikary A. et al.Study of proper use of inhalational devices by bronchial asthma or Copd patients attending a tertiary care hospital. in J Clin Diag Res.Year 2014, Volume 8, Issue 10. Vice- President, Association of Physiological Sciences. Associate Editor, Indian Journal of Physiological Sciences.